Validating A CSS Test Using Red Mist ~ Feel For The Water! Advice & Tips to Improve Your Swimming. 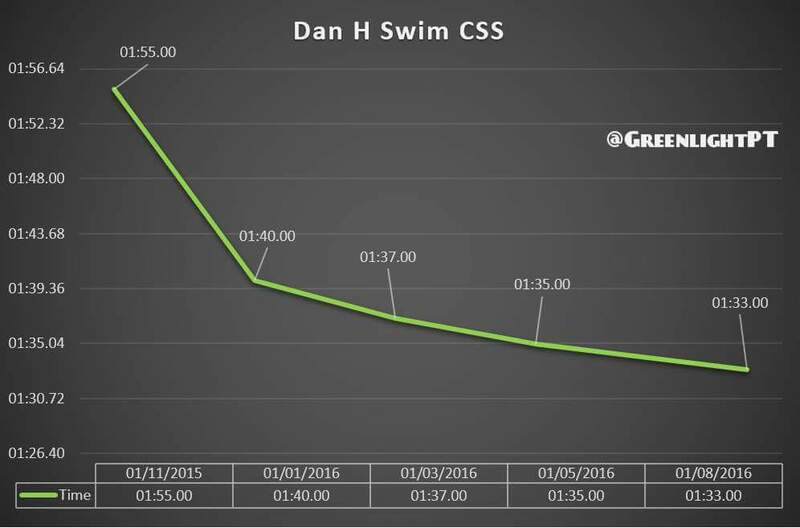 Swim Smooth didn't invent the concept of Critical Swim Speed (CSS) but we like to think we had a lot to do with making it popular. 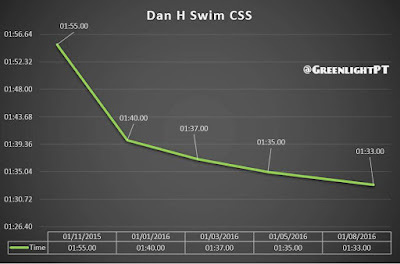 CSS training helps you determine your fitness level and set your training paces so you get the biggest fitness gains for distance swimming (e.g. triathlon and open water races). The calculator spits out your CSS pace per 100m - which should be roughly the speed that you can sustain for a 1500m timetrial. From there you can set your training paces for different training sessions, ideally programmed in a Finis Tempo Trainer Pro for maximum accuracy and feedback as you swim. 1:33 / 100m over the last year! However... one problem with the CSS test is that it is very sensitive to your 200 and 400 times, and requires you to swim two well paced timetrials that are representative of your current fitness. Fatigue from other training sessions can play a role and if you're not an experienced swimmer it can be easy to start too fast and then blow-up, or start too slowly and underperform. If something like that goes wrong, your 200 and 400 times will be off and the calculator will give you an inaccurate CSS pace. Or if you're not quite up to that yet, swim this set as 10x 300m instead (known as "Pink Mist"). If you find that session hard but do-able then you know your CSS pace is accurate. 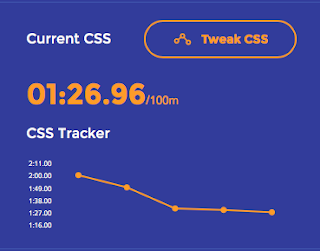 But if it's way too hard or too easy then you can adjust your CSS pace slower or faster to compensate. Then repeat the Red/Pink mist session again a week later to see how it feels. So the next time you swim the CSS test, validate it using a longer session such as Red Mist and be confident you're at the right starting point to take your swimming forwards. Have you ever discussed the role of turns whilst doing the CSS test? In a 50 m pool and even more in a 25 m pool it should have quite a large impact on your resulting times. I guess my point is that a lot of ones CSS improvement might come from improving your turn technique. 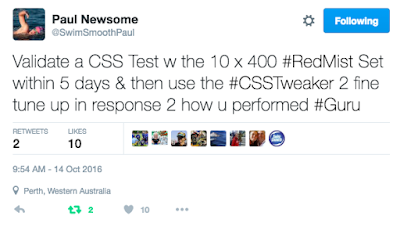 I like this post, in fact I have always hated the CSS test. I reasoned the contrary: if I can swim a classic Red mist and Goldilock set with a CSS then I have the CSS !! Seriously, I think testing the validity of the CSS with a real session is important, I also believe that, with a given CSS, having difficulty on a fresh & fruity session and not on a classic red mist session (or vice versa) can say something important on your degree of training, strength and weaknesses. Always useful to read this blog, nice people and great information! Thanks Alberto! You're right on par! Hi Sven, yes indeed you're also correct. The key is to make sure you test in the pool length you're likely to do most of your harder CSS / RM sessions so you can compare apples with apples. Switching between pool lengths can be a bit problematic for sure! when i attempt the red mist set 10 x 400's what should my rest between reps be? i was thinking 60 secs? Hi Andy, no that'd be too much rest for this type of set. Go 1 beep recovery between the 400 intervals (so about 20-30s depending on your speed) and then between sets quickly take the time down and then go again aiming for no more than 30-40s rest. Hope this helps.